The Man Who Wasn’t There… or was he? The Man Who Wasn’t There…or was he? “Frederick Manning Whatson” of the 1st AIF and the North Russian Relief Force. Our story begins in 1897. In that year, 18 year old Amy Florence Jay of Bellingen married 23 year old schoolteacher Frederick Whatson, who taught at the Thora and Sunny Corner schools. On the 31st of December 1898, their first child, Frederick Manning Whatson, was born. The family eventually moved out of the Bellinger Valley, as Frederick Snr was transferred to Castlereagh near Penrith in Western Sydney. In 1914, the “War to end all wars” broke out, and on the 5th of May 1918 the young Frederick Manning Whatson, now a 19 year old clerk, arrived in Sydney to enlist in the Army. He was healthy, with excellent eyesight, was 5’7” tall, weighed 142lb and had brown hair. Oddly, he gave his mother’s name as “Margaret”, not Amy, and he gave his home address as “Penrith Post Office, NSW”. Nine days later he was accepted as recruit No N89174, and sent to Liverpool Army Camp in Western Sydney for training. All did not go smoothly. On the 6 of June he was reported twice for being Absent Without Leave, and sentenced to 4 days Confined to Barracks. On the final day of his confinement, he admitted that he had lied to the recruiting officers – he was actually Ernest John Clinton Heathcote, he had been born in Bathurst on the 6th of October 1901, and was therefore under age. He was discharged from the Army the next day, “pending further charges”. 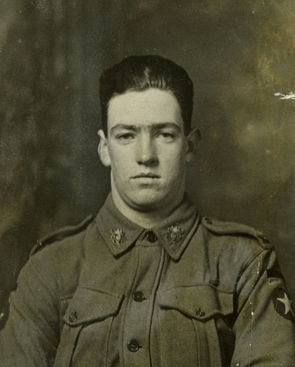 A month later, on the 15th of July 1918, another Frederick Manning Whatson walked into the Army recruiting office in Brisbane and applied to enlist. He was 1.25” taller and 7 pounds lighter than the previous “Frederick Manning Whatson”, and his hair was fair, not brown. He put his address as the “People’s Palace”, Brisbane (a Salvation Army Hostel) and his next of kin was an uncle living in the USA. He was accepted the next day, passed the medical, and joined “Ryan’s Thousand”, 6th General Reinforcements, as recruit No 58180. After initial training he was sent to Sydney for transfer overseas. In early August he was granted two days home leave, and on the 26th he made out his will, leaving everything to a friend, Mrs Buchanan of Edith St Wynnum in South Queensland. On the 4th of September 1918 he embarked for England on the Australian Troop Ship AT41 “Bakara”; but on the 20 of October, while Frederick was halfway to England, something peculiar happened. Another Frederick Manning Whatson walked into the East Sydney recruitment depot and applied to join the AIF. He nominated his father Frederick as next of kin, and gave his home address as Orchard Hills Public School, near Penrith, NSW. He was about the same height as the Frederick Manning Whatson who was now en route to England, but was 21lb lighter; and he gave his religion as Methodist, rather than Church of England. He was given the number N95825, but the Army quickly realised they already had all the Frederick Manning Whatsons they were going to need. He was discharged under Section 41c, (lying to an officer), and told to go away. Ironically, this was probably the real Frederick – the Whatsons were a Methodist family. We can only imagine his feelings at learning that someone else had stolen his identity! Nine weeks after leaving Sydney, on the 14th of November 1918, the man who was known as Frederick Manning Whatson reached England and disembarked to join the 9th Battalion AIF. He was too late. The War had ended three days before with the signing of the Armistice, although the surrender would not be signed until 1919. The unfortunate Frederick spent most of the next five months in and out of hospital, being treated for tonsillitis, bronchitis, laryngitis, influenza, etc. By the middle of 1919 Frederick and the other members of the AIF were becoming annoyed at the Australian Government’s delay in demobilising them and bringing them home; so when the opportunity came for them to leave the AIF, join the British Army, and become part of the North Russian Relief Force, many of them put serious thought into accepting. The British, Americans, French and others had been fighting in North Russia since mid-1918 – ostensibly to retrieve Allied supplies which had been given to the Czarist forces, but also in an effort to support the Czarists and try to help them defeat the Bolsheviks, who were taking over the country following the Russian Revolution. Between two and three hundred Australians agreed to join the relief force – to help the Allied cause, to make some money, or just for the chance to see some action. Frederick Manning Whatson was demobbed from the AIF on the 12th of June 1919, and immediately joined the British Army as a Machine Gunner. The situation was urgent – it was only eight days later that Frederick disembarked in Arkhangelsk, as one of four Australians in a group of South African and Canadian soldiers. He moved to the main Allied base at Ossiniova, some 500km into Russia, and over the next couple of months took part in some extremely fierce fighting. By the end of August, 26 of the 42 soldiers in Frederick’s group had been killed and 13, including himself, were injured – a greater than 90% casualty rate. Frederick suffered a broken leg, wounded ankle and dislocated elbow, and was only saved from certain death by the timely arrival of the Royal Fusiliers. Frederick’s wounded ankle turned gangrenous, and he was invalided back to England on the 29th of August 1919, with the likely prospect of having his leg amputated. Meanwhile, back in Australia, other events had been unfolding. On the 30th of June 1919, the Army received a letter from a worried lady whose underage son had enlisted in mid -1918. She had been widowed some years before and had remarried – her current name was Maria Lane Franklin. The boy was her only child from her previous marriage, she was worried about him, and she wanted him to come home. From information supplied by the Red Cross, she believed he had enlisted in Queensland under the name of “Whatson” or “Watson”; but his real name was Ernest John Clinton Heathcote. The Army politely replied, asking for a Statutory Declaration of identity; then, taking the lady’s word for it that Whatson was in fact Heathcote, they amended his records to reflect his “true” name and entered Maria Franklin on his papers as next of kin. They couldn’t establish contact with him or bring him home, though, because he was now in a different nation’s army, fighting a different war. By December 1919, after several further letters to the Australian Army that achieved little, Mrs Franklin’s only remaining option was to contact the War Office in London. 19th of October 1921 – The AIF wrote to Mrs Franklin, asking for the whereabouts of F M Whatson, so he could be issued with his war medals. 29th of December 1921 – The War Office in London notified The AIF that F M Whatson qualified for the British War Medal and the Victory Medal, but his current whereabouts were unknown. 29th of August 1922 – The UK Ministry of Pensions contacted Australia House for information regarding Frederick Manning Whatson, so he could be given a pension. The AIF via Australia House then supplied the British War Office with details of F M Whatson’s Australian service. 23rd of November 1923 – Frederick Manning Whatson, Bank Clerk of Haberfield in Sydney, married Ethel Grace Moody of Bellingen in St Margaret’s Church, Bellingen. 4th of August 1925 – Ernest John Clinton Heathcote contacted Victoria Barracks, stating that he had enlisted under the name of Frederick Manning Whatson, and giving accurate details of Whatson’s military service. He requested that the Army provide him with a new discharge certificate in the name of Heathcote. Late August to late October 1925 – Ernest John Clinton Heathcote, labourer of Morwick St Strathfield, signed a Statutory Declaration stating that he had enlisted in the Army under the assumed name of Frederick Manning Whatson. After he paid the required fee of two shillings and sixpence, a discharge certificate was issued in the new name. 1st of June 1966 – Earlwood Ex-Servicemen’s Club contacted the Australian Army for service details regarding Ernest John Clinton Heathcote, currently of Hamel Crescent Earlwood, so that he could join the club. And there the story, from the Army’s point of view, appears to peter out. Bank clerk Frederick and his wife Ethel went on to have four children, and Frederick continued working for the Commonwealth Bank. He never served in WWI, but he became a Warden in WWII. Frederick died in 1980, and Ethel died on August 5th 2001. Were the first and second “Fredericks” the same person? They had different hair colour, different heights and different weights, so it seems unlikely, even though they both later claimed to be Ernest Heathcote. Did poor Mrs Franklin ever find “her” Ernest Heathcote? Who finally collected “Frederick’s” war medals and pension? Who signed the statutory declaration and gained a discharge certificate as Ernest Heathcote? Who applied to join the Earlwood Ex-Servicemen’s Club as Ernest Heathcote? “Ernest was a member of the Earlwood Ex-Servicemen’s Club. “And why did he choose the name Frederick Manning Whatson? He had told us that it was the name of one of his school teachers who he apparently liked. No doubt he would not have thought that a man of Frederick’s age would be enlisting to go off to war, particularly as he was a teacher. I was very surprised to read about Frederick jnr. and I am sure my father would have also been surprised, as with such dedication to fight for the cause he would not have wanted to deprive another of his generation of the same opportunity. “Ernest attended Perthville School (near Bathurst) and Parramatta High School. I am not aware if he attended any other schools. “Ernest joined the New South Wales Police Force and was living with his mother when he married Daphne Ethel Evans in 1927. They bought a house in Earlwood and had three daughters before transferring to Broken Hill where their fourth daughter, myself, was born. Three years later the family was off to Cobar for three years, then back to Sydney for three years, then back to Cobar again (that amazed me, but they loved the place). After seven years they transferred to Queanbeyan for three years, then went back to Sydney so that they would be in their home at Earlwood when they retired. They moved to Palm Beach, Queensland in 1967. Ernest died in 1984 and Daphne died in 1988. If my mother ever looked upset when my father came home, he would ask “Who has been upsetting your mother?” and we all knew “you must not upset your mother”. He obviously learnt his lesson and made sure we learnt it as well. Information assembled by Jim Sweeney, July 2010, from files held by the NLA and AWM and available online, from information published online by Vladimir Kroupnik, and from the resources of the Bellinger Valley Historical Society. Updated January 2011, with thanks to Heather Owen, nee Whatson. Updated again May 2012, with thanks to Pamela Thrum, nee Heathcote.